Audiologists Erwin Voltaire Ungui still needs hearing aid batteries after his cochlear implant surgery in 1998. He was the first adult bilateral patient to receive cochlear implant. His second operation was conducted at the Philippine General Hospital (PGH) in 2006. Cochlear implants restored hearing in severe to profoundly deaf patients, according to Dr. Charlotte Chiong, a Clinical Associate Professor from the University of the Philippines-Philippine General Hospital (UP-PGH), and one of the only two ENT (Ears, Nose, Throat) surgeons in the country who perform cochlear implantations. She said many of the cochlear implant patients were able to attend mainstream schools and developed their speech after the operation. 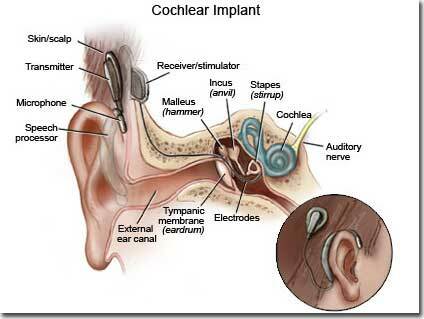 Cochlear implant is an electronic device that compensate for the damaged or non-working parts of the inner ear. Experts said an implant does not restore or create normal hearing. But it can give a deaf person a useful auditory understanding of the environment and help him or her understand speech. When hearing becomes normal, parts of the inner ear convert sound waves in the air into electrical impulses. These impulses are then sent to the brain, where a hearing person recognizes them as sound. A cochlear implant works in a similar manner. It electronically finds useful sounds and then sends them to the brain. The implant is surgically placed under the skin behind the ear. Maternal rubella, a contagious viral disease, with symptoms like mild measles and drug and alcohol intake during pregnancy are the usual causes of hearing loss in babies. But in Erwin’s case, he was born with normal hearing until he was accidentally hit by a baseball ball on the left side of his head when he was seven years old. Erwin completely lost his hearing on the right ear after the accident. His left ear was barely functioning. He was initially operated on in October 1998 and his life has changed dramatically. He pursued his studies at the UP-PGH to become one of the few persons who earn a degree in Master of Science in Clinical Audiology in 2001. As an audiologist, Erwin helps take care of people with hearing loss through diagnosis, early intervention and rehabilitation. He helps patients fit their hearing aids with the right amplification. Note: My interview with Erwin Ungui appeared in People’s Tonight in 2006. This entry was posted in Technology and tagged audiologist, cochlear implant, Erwin Voltaire Ungui, hearing disability, hearing impaired, info on cochlear implant on January 14, 2011 by Yami. This device can really give hope for those who suffer from hearing loss indeed. I can tell that more elderly people are going to love this too.